When you think of buon fresco the mind travels in space to Italy, and in time to the most glorious moments of the Roman, medieval and Renaissance world. It does not take you to Manassas, a small town in Northern Virginia. But it is here that a new chapter is written in the book of this ancient and venerable art form. Here, two 20’ tall frescos are in the making in the new chapel that is being raised at Seton High School, the dream of forty years of its founders, Dr. and Mrs. Carroll. Ioana Belcea, design and art director for the project, is the artist who is executing the frescos. Belcea is an artist specializing in liturgical art and design with expertise ranging from illuminated miniatures to large mural works in a variety of styles and media (www.ikonworkshop.com). She is consulted in this endeavor by fresco master iLia Anossov, founder and director of the Fresco School in California, and much sought after master plasterer Ian Hardwick. From the beginning, the Seton community has been involved in the project on many different levels through internships and volunteer opportunities for young men and women. 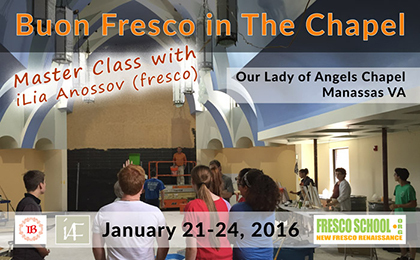 Now, we are inviting the world community to experience the excitement, by offering a master class in fresco to be taught by Mr. Anossov on the site of the creation of these two frescos. During the class students will learn two methods of fresco painting: Roman and Renaissance. They will explore plaster preparation, cartoon-making and transfer methods, raw pigments, and painting techniques through lecture, demonstration, and studio practice. Each participant completes two or three buon fresco tiles. The cost for the class is $1,299 which includes the full set of Buon Fresco Painting Foundation DVD Tutorials. For more information on the DVDs please visit FrescoVideos.com.